With our New Year’s Eve celebration done and dusted (nay, survived), and the long list of resolutions scribbled into our journals or written carefully into our calendars, it would come as no surprise to most that a resolution be made on the topic of fitness. But how about a challenge? 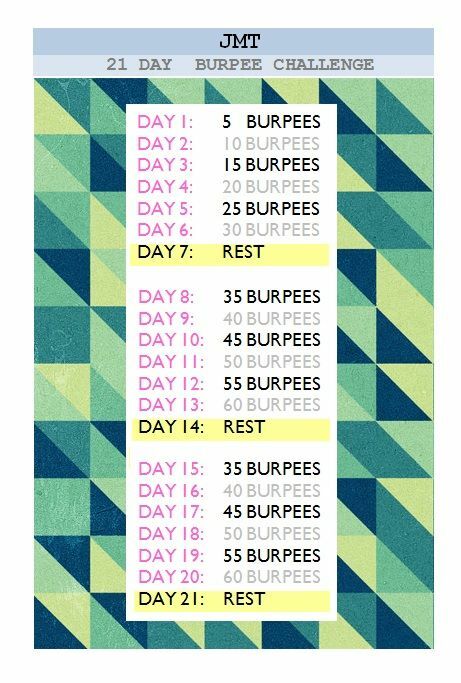 How about a burpee challenge formulated specially by JMT that can be undertaken in no more than 21 days? Wouldn’t it be nice to complete a resolution before the month of January is even finished? We shout a loud and precocious “Yes!” here at the JMT offices, so we’ve kindly broken it down for you, from warm up, correct burpee form, to the challange that can be easily followed and incorporated into your daily schedule for the next 21 days. So lace up your trainers, JMTers, find a nice roomy/flat surface, and assume your burpee formation. Let’s go! JMT recommends a good warm-up of any form of exercise that elevates the heart rate such as skipping, power-walking, and star-jumps. 5-10 minutes should have you ready and eager and for the next stage of the challenge: the burpee. In it’s most basic form, the burpee comprises of a squat, kick back into an upright push up position, with bending of the elbows into a push-up, jumping of feet back to squat position, followed by standing up and jumping as high as you can – and repeat! So who’s with us? Let us know in the comments below!